I've added a new product line to the Whimbrel Nature Photography website. 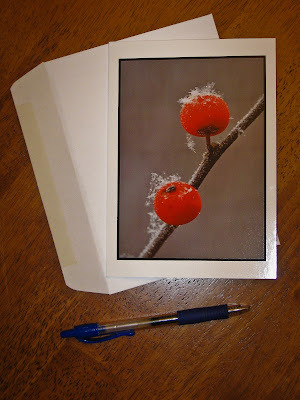 It is now possible to order both blank and custom, high-quality, folded greeting cards featuring any of my images. Simply click on Buy Image, then the Products tab, and then choose the appropriate cards and quantity. The cards are 5x7 inches, printed on card stock with a high gloss finish. The image will be centered on the front of the card with a white border (no black border unless otherwise specified). Ordering custom cards allows you to print your own custom text on the inside of the card; perfect for holiday greetings, personalized thank you notes, invites, or celebrations. Blank cards are $25.99 for a pack of 12 and custom printed cards are $49.99 for a pack of 25. All cards come with envelopes. Order early for the holidays! Do you have need of a custom greeting card? No gloss finish, linen card, 4x6 size. Just contact the artist to arrange a custom printing. Great idea, Eli! Hope the opening went well.